This is a simple Greek recipe often prepared in the villages. 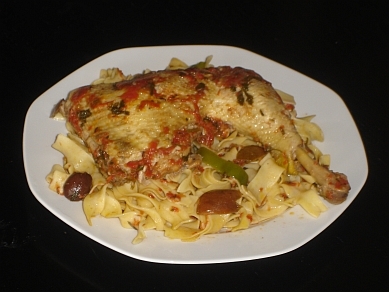 Along with the green peppers and olives, the chicken is also served with hilopites. Hilopites are a kind of egg noodle widely available in Greece, which can either be small squares or ribbons (see photo). If they are not available where you live, then tagiatelli is a suitable alternative. The photo shows leg of chicken, but obviously it can also be breast, depending on people's preferences. Kids love this dish, by the way! Put the oil in a wide, shallow pan and fry the chicken portions on both sides – approx. 4 minutes each side until it colours. Add the red wine, salt and pepper and leave for 2-3 minutes. Add the onions, garlic, parsley, bay leaf and thyme and stir for 2-3 minutes. Add the tomatoes and peppers and mix them in. Cover the pan, lower the heat and simmer for 1½ - 2 hrs – until the chicken is tender. Add the olives approx. 5-10 minutes before the end. In the meantime, boil the hilopites (or tagiatelli) in salted water just as you would prepare spaghetti or any other pasta. Add butter when they are ready. Serve the chicken mixture on top of the hilopites. So craving for this one ..